There's a terrific article in the San Antonio Express-News edition of Jan. 7, 2014, written by Hector Saldana, about one of the Rolling Stones' earliest concert appearances in America. Alas, the article is hidden behind a pay wall. But the gist of it is this: At their San Antonio appearance on June 6, 1964, the Rolling Stones were heckled, booed, hissed, pelted with various objects - and those weren't even the biggest indignities. What was? They had to follow a trained chimpanzee act onto the stage. The Stones were in San Antonio in June 1964 to play a series of 20-minute sets at something called the Teen Fair of Texas. 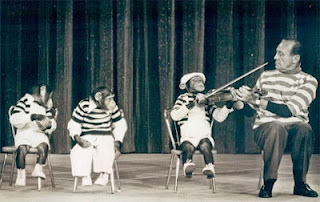 They were on a bill that included country music's George Jones and a chimp act that was actually very well-known at the time called the Marquis Chimps. The Marquis Chimps appeared as guests on early television variety shows, performed in commercials and movies. And, obviously, they did live performances on stage. They also co-starred (with, among others, Jack Weston) in a sitcom called The Hathaways that ran on ABC from late 1961 through Spring 1962. The clip above is from the Jack Benny Hour, an episode that included Señor Wences and Bob Hope. Make sure you catch Hope's quip at the end of the clip - he made fun of having to follow a bunch of chimps. Saldana's article Stones bassist Bill Wyman's memoir about the Stones' 1964 San Antonio sets: "Everyone got a poor reception from a mixed crowd of cowboys and kids. We had to go on after some performing monkeys. What the hell were we doing there? People didn't know whether to take us serious or as a joke." Saldana brings up something odd, though: In Keith Richards' book, he mis-remembers the act they followed as circus seals; then-Stones-manager Andrew Oldham also told Saldana that they followed trained seals. Great examples of how easily malleable memories are. Their June 1964 appearances in San Antonio weren't the only trying gigs for the Stones on their short swing through the United States. They were openly mocked in at least one television appearance by the show's very famous host. Grilled chicken has arrived at Dunkin Donuts. The chain has announced the introduction of the Grilled Chicken Flatbread sandwich, which is available now at participating locations. "Shake up your taste buds," DD's website proclaims about the new offering. 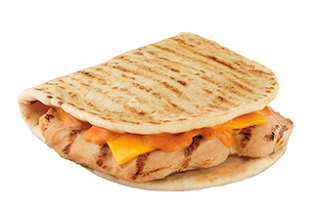 The grilled chicken is served inside a multigrain flatbread. It is topped with a slice of reduced-fat cheddar cheese, and an ancho chipotle sauce tops it off. Nutritional info: One Dunkin Donuts Grilled Chicken Flatbread has 360 calories, 12 grams of fat (3.5 saturated), 1020mg of sodium, 3 grams of fiber and 28 grams of protein. We really loved the Turkey Breakfast Sandwich that DD had on its menu a while back, so we're looking forward to trying the Grilled Chicken Flatbread. If you've already tried one, let us know what you think of it in comments. Here's a cute video of a dog playing fetch all by itself, without the need for any human to throw the ball it is fetching. How? His owner, an engineer, built a catapult for the dog to use. And the dog learned how to use it!